I always see humans wearing sunglasses. I was told it is to protect their eyes and make it easier to see in the sun. I asked my mom if I could wear sunglasses. So she went into the closet and pulled out doggles for me and BunnyBell. I have no idea why they were in the closet! 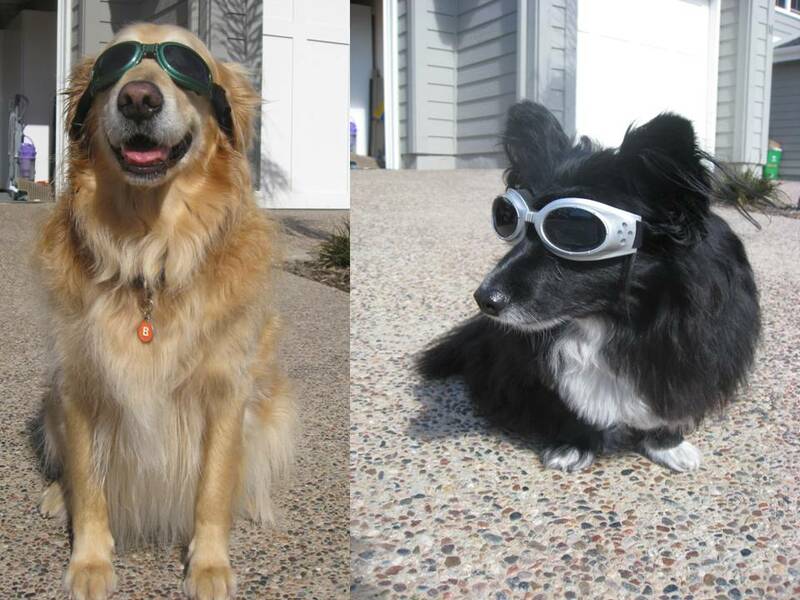 Anyway, BunnyBell and I went outside with our doggles and we agreed it helped with the glare. However, we also agreed we did not like them. She pawed them off. I kept them on since I was getting a lot of attention. And don't you think I look cool? Since the south side of the beach has a lot of Springbreakers, we decided to do the north side yesterday. And it was fairly empty. We hadn't been there in awhile. My mom forgot how beautiful it was. So of course, that meant photo shoot. She even made me model in the ocean! Next, she will probably want to take underwater pictues, but she needs underwater equipment. Actually, she can probably use the camera that fell in the toilet bowl. It is obviously waterproof. It took these pictures! We usually don't see too many people on the beach except in the summer. But this past week, it has been Spring Break. So there are lots of extra people taking up lots of space which makes it hard to peacefully take our beach walks. So while my mom gets annoyed, I like it. Even more people come over and pet me and tell me how handsome and wonderful I am. And anyway, isn't my life at the beach just like one big Spring Break? A few weeks ago, when my mom's phone fell in the ocean, she went to get a new phone. She got a Black Blackberry. (that is a bit redundant.) But there were 2 phone boxes in the bag. She did not take the other one out but I saw it. Do you think it is a surprise for me? My birthday is not coming up until September. I wonder what I would do with a Blackberry. My paws are way too big. Maybe I could sell it on eBay. 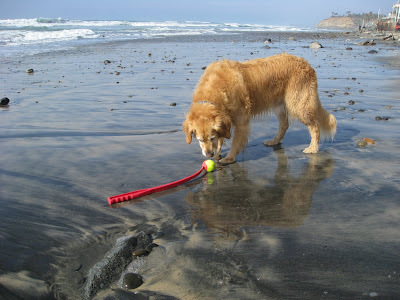 Tourists often ask my mom about our chuckit!. I can't believe not everyone knows about these things. My mom picks up the ball with it, and then throws it out real far. It is particularly important at the beach. If she didn't have it I wouldn't have very far to go for the ball because she throws like a girlie girl. (My dad doesn't really need to use one). Anyway, I am glad I was born after chuckits were invented. Today is my human nephew Drew's birthday. He is now two years old. When he visited last summer he liked throwing the ball to me. So I suggested to my mom that we get him a case of tennis balls for his birthday. My mom didnt think that was a good idea. She said that would be a present for me. So I thought, yeah, so? Well, Mom ended up getting him a scooter. Maybe he will bring it with him when he visits and let me ride it. I can't wait to see him! I had an idea yesterday that maybe I could stay longer in California. As I was passing lifeguard headquarters at the beach I thought, what if I applied to be a lifeguard? There are always more lifeguards in the Spring and Summer, so I think they may have at least one opening. I have excellent swimming skills, even in the highest waves, so no problem there. I am a big strong dog so a person can just hold on to me and I can swim them in to shore. I could bark at people that are not obeying regulations. Yes, I think I would make a good lifeguard. Ok, maybe Junior Lifeguard. Oh yeah. And aren't lifeguards chic magnets? Mom puts things in her jacket pockets and they fall out. Up until last week, it would be poop bags. But last week, her cellphone fell in the ocean. Then a few days ago, her camera fell in the toilet bowl. Her pockets are very small and she always worries that things will fall out. So I don''t understand why she continues to put things in those pockets. Maybe she needs reward training. If I offer her a treat, do you think she will stop putting things in her pockets? The other day we went to a place called Elfin Forest. My mom thought it would be a pretty hike to do with me and Bunnybell. 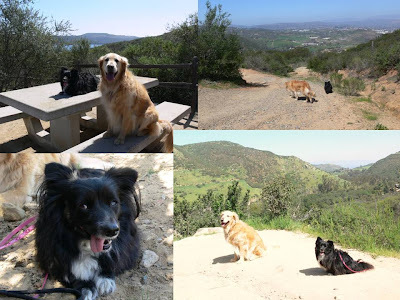 As we started the hike a man coming down asked if the little black dog (Bunnybell) was going. He said it was pretty steep. Did that give Mom a clue? Of course not. We kept on hiking up and up and up to what seemed like forever. Bunny and I were EXHAUSTED. Along the way people kept telling us we were almost at the top...but we kept climbing. So finally we got there. Mom made Bunny and me pose on top of picnic tables to get the pretty scenery. And after a few minutes, she said, ok , lets go back down. We hiked up 1.5 miles to 1200 ft just to go back down 1.5 miles? Help me here, what exactly is the point? 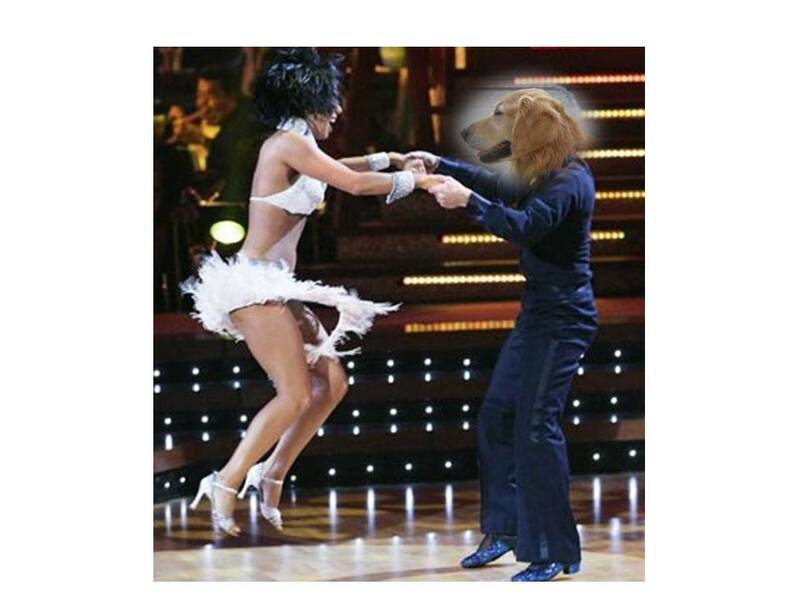 Dancing with the Stars is on tonight. It looks like fun to do all those different dances. When my mom dances, I follow her around. Sometimes she holds my paws and dances with me. It must be great to have cool costumes and get applause. I wonder when they are going to do Dancing with the Dogs. I would love to be a contestant and dance with Cheryl Burke! My mom got a bit annoyed with me yesterday on our walk. She didn't have much time and I kept on stopping. Well it was Saturday, a big day for pee-mail. Humans say we are marking our territory. Pulease. It is pee-mail. Why can't they understand, it is quite simple. 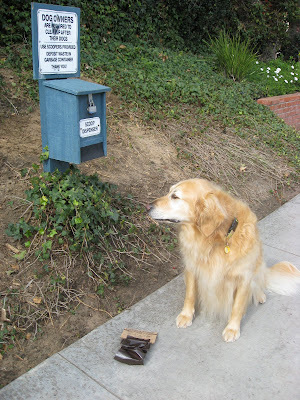 We sniff to "read" our new mail and we pee to "write" our new mail. That is how we keep in contact with our friends. Sorry Mom, I cant help it if I am so popular. Today is my human sister Sydne's birthday. She is a pretty, smart and stylish as is her dog BunnyBell. And Sydne is so in the know about all the trends. She even has her own popular fashion blog http://www.thinkthrufashion.com/. So I guess we have that blogging gene in common . Even though we are siblings, I did not get her love of shoes gene and she did not get my love of pizza gene. (Our mom loves both!) So that means no pizza party. Bummer. Maybe we can have pizza for BunnyBell's birthday next month? I absolutely love bed. I could lay in it all day. (Which I often do). In the morning, I love to STRETTTTTTTTTTTTTTTTTTTTTTCH. Then when no one else is in bed I get to ROOOOOOOOOOOOOOOOLLLLL. My Mom and Dad got me my own large dog bed, but it is just not the same. I wonder if they can fit another king size bed in their bedroom for me in our new house. Yeah right. Nothing wrong with dreaming, especially about bed. Funny thing happened the other day. (My mom didn't think it was so funny at the time.) On our beach walk, there was a very deserted part of the beach so I thought it would be a nice private place to poop. My mom reached inside her pocket and oh no!, the poop bags must have fallen out. No extra poop bags in site. The only tool she had was the chuckit. She proceeded to rake up the poop which ended up starting to mix with the sand. Then she tried to dig a hole with the other side of the chuckit. Then she tried to bury the poop mix in the hole. Then she picked up a giant rock and put it over her mess. I really hope no one stepped in it. But if someone does, they say it is good luck. I have a feeling there will be a lot of good luck going around. 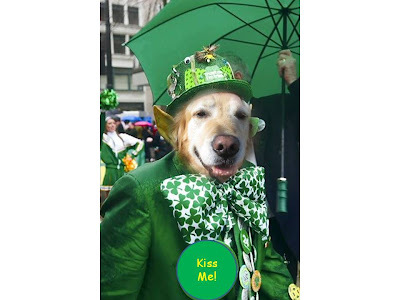 Today is St. Patrick's Day. I celebrate since my dad is Irish. I don't have all Irish genes. I don't drink, could I have a virgin Guinness? I don't like cabbage...way too weird. But I do have some Irish genes. Green is my favorite color. I love corned beef. And I love being kissed! It is fun to be Irish, especially today! Happy St. Patrick's Day to all! I got bad stuff in my ear again, it doesnt hurt, it just smells bad. It happens every 3 months or so. The vet says it is from the ocean water. (even though my mom does clean my ears fairly often). And every time it happens, I can't go swimming for at least 5 days. And everyone feels so bad for me. If I do the math, that translates to annually giving up swimming for 20 days in order to swim for 340 days. I have therefore decided that it is worth having bad stuff in my ear sometimes. Today I get to go swimming again. Yesterday was a great day. 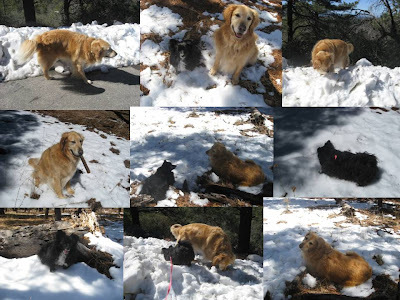 Mom took me and Bunnybell to Mount Laguna to see snow for the first time. The first thing I did of course was pee to let everyone know I was there. Bunnybell lifted her leg and copied me. Then we went to a bigger patch of snow and I ran around fetching sticks. It felt so good under my feet. My mom threw a snow ball to me. I didn't quite get that. So I tried digging and making my own. Then I stuck my nose in the snow and made a snow angel. Snow is really great. Especially enjoyed at 50 degrees! Mom has her own business. She works from home. She has one employee, that would be me. I started as a junior analyst and in 3 years I have worked my way up to Vice President of Operations. I was spread a bit thin, so I hired my niece BunnyBell part time as Manager of Food Service. She is such a great barker, that I gave her some security responsibility. I am now thinking what my career goals are. And I need to ask mom for a raise. Come to think of it, I don't get paid. I was invited to a SciFi party today on Twitter. All my anipals are in these great costumes. I don't know anything about SciFi. 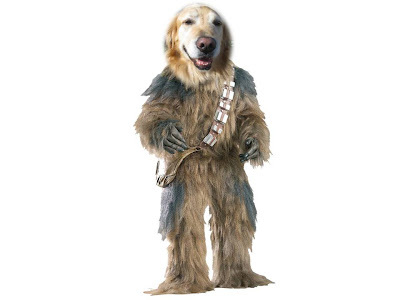 But then I thought of Chewbacca. I have so much in common with him. He is described as "a gentle, hairy, non-English speaking co-pilot" -- that is exactly like me! And he is a sidekick of someone who saved him. Well I am Mom's side kick and she rescued me. So it is perfect! I am ChewBearca! Yesterday my business cards arrived. 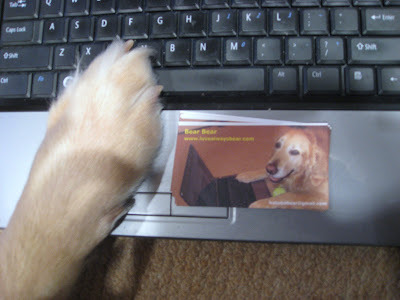 Yes, my mom felt that now that I am a serious blogger, I should have cards with my website and gmail. Plus. we always get asked for the blog name when people see my mom taking pictures of me. Now, I can carry them with me when I walk and paw them out to interested parties. Oh, that means I need a business card case that hooks onto my collar or leash somehow. Knowing my mom, that is probably coming in the mail next. I love when Mom gets in the mood for peanut butter. She takes a spoon and puts jelly on it too. 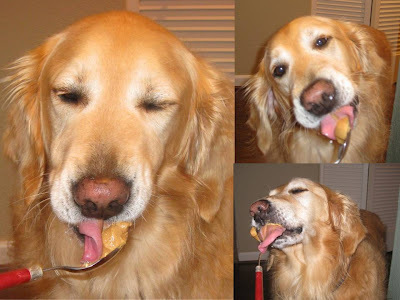 Then she gives a spoon of plain peanut butter to me. Yes, it is weird to lick and chew, very sticky. But delicious. I am just not sure about the peanut butter and jelly thing. I would rather have a peanut butter and bacon sandwich. Hold the bread please. Yesterday I walked in the neighborhood of Solana Beach. My parents were looking to get a condo there last year, but they weren't able to. Almost all the buildings only allowed 1 dog or small dogs. (My brother was still with us at the time so we were a 2 dog family). So today my Mom needed a poop bag and luckily there was a dispenser. But it was so silly. The size of the bag was for like maybe chihuahuas? So again, we felt discriminated against in Solana Beach. But the town is really dog friendly. I even get to go in the yogurt shop! (But I guess I have to poop elsewhere). I really wish I could surf. Every time I take a long walk on the beach I see the surfers having so much fun. I even have my own surf board. My mom and dad bought it for me a couple of years ago. The only time I used it was the first day they got it. They put it in the pool and had me go on it. It was very very cool. But I wish they would put it in the ocean for me. 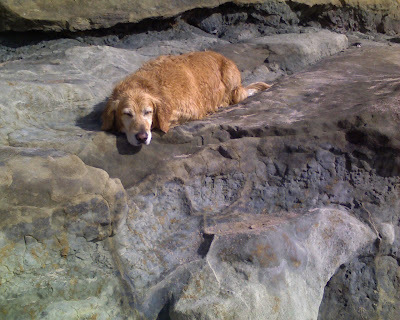 Then I could enter the Loews Coronado Surf Dog competition. I wonder whether I should get a wet suit. I went to Los Angeles this past weekend with my Mom. I have never been to a big city before. So many people, cars, sirens, helicopters, oh my! And things were very strange for me. I had to go in an elevator when I needed to go out to pee; I sat out on a terrace up so high I could see the city buidlings in the distance and bright colorful lights at night; I kept on waking up since it was so noisy outside; I had to be on leash at all times out of the apartment; and there were very few big dogs, mostly little dogs scared of big dogs. But I did do fun things and saw famous places, so I am glad I had the experience venturing out into the big city. But the visit made me realize, I am not the city type. It is a nice place to visit , but I prefer my quiet beach life. Does that make me boring? 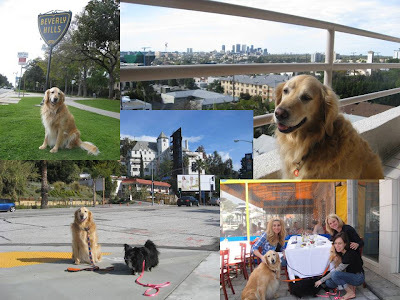 I was visiting my sis and niece, Bunnybell in Hollywood this weekend. I had a very interesting walk this morning. We walked by the Argyle hotel and a lot of commotion was going on. They had all these pics of movie stars outside. Then I saw this giant thing that looked like a man. I asked mom what it was. She told me it was topiary that was in the shape of an Oscar statue. I wondered why it was there. She said that there is a big Vanity Fair party at the hotel tonight for celebrities after the Oscars. I wonder if AirBud is going. Actually, I wonder if AirBud ever won an Oscar. If he did, was it in the shape of a dog? 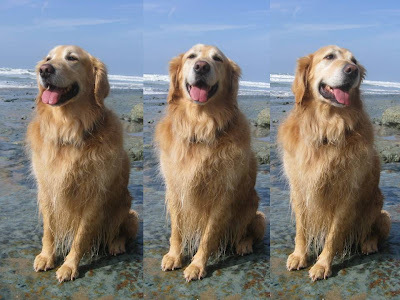 I belong to the Golden Retriever Meet-up Group here in San Diego. It has over 700 members! It is very cool. I haven't been to that many events because my parents keep being out of town. They do parades, hikes, lake play, lunch, etc. I wonder if they will have a meet-up group in my new home town. I hope so. Otherwise I will start one. Bear, the group leader. I wonder if the power would go to my head? PS-- I'm the golden standing in the picture. I don't like to blend. 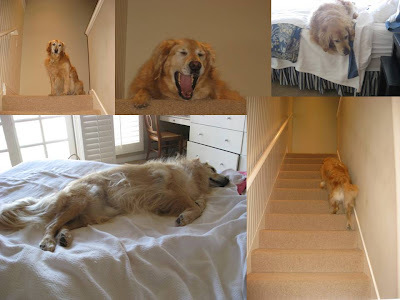 Everyone wonders what I do when I am home alone Well, I start by going upstairs, jump into bed, roll around a bit and then take a nap. 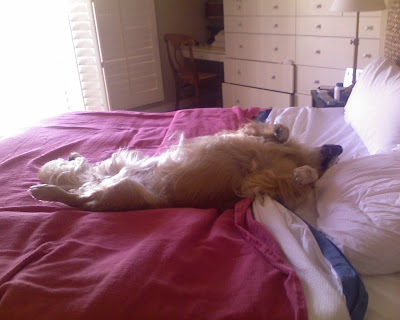 Then, I go into the other bedroom, jump on the bed, roll around a bit and then jump down. Then I contemplate what to do next. I usually will walk around to see what clothes or shoes are left out and bring one item downstairs. If I want to go for a walk it is a sneaker or a sweatshirt. If I want everyone to come home and go to sleep it is a slipper or pajamas. Once I am downstairs I go to my Mom's office and take a nap. When I wake up if I am still alone, I go back upstairs and then start all over again. Pretty exciting, huh? Every time before my mom goes out, she takes me for a short walk to do my business. I usually will pee, but sometimes she expects me to also poop like I am a poop machine! Like last Saturday, we went out twice in the morning and I pooped both times. Then she was going to go out for a few hours so she took me for a walk again. I could tell she was waiting for me to poop. So I crouched down in some very dense plant stuff. After I got up. She went to look for the poop to pick it up. She couldn't find it. It was a bit rainy and the ground was wet so she gave up. But she was happy that I pooped so then she could go out. So that is my new trick Fake a Poop! On our walk yesterday, my mom asked me to pose at a beautiful empty spot at the beach. So I sat and looked to the right. She snapped. She asked me to look at her. I did. She snapped. Then I looked to the left. She snapped. She praised me for how good I was. Then she called my sister and told her what an amazing natural model I was, posing with different angles. What does she expect if she takes what seems like a billion pictures a week and then makes me watch Top Model? Yesterday was a beautiful day. So as usual my mom decided we need to take advantage of it and get our beach excercise.We have pretty much the same routine on every nice day. First, we go to the off leash part of the beach and I get to swim, fetch and play. Then it's Mom's turn for excercise, so we walk about 2 miles down the beach and sit and rest somewhere along the way. And as long as I feel up to it, my mom lets me swim and play again after walking the 2 miles back. Yesterday, instead of just a rest, I took a quick nap. Yes, life is good. 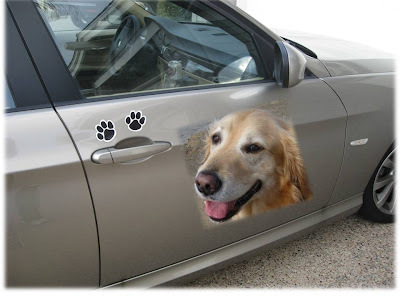 My mom has always had magnetic paws on her car. They usually are on the back. 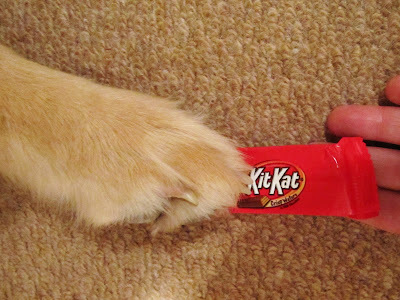 So it got me to thinking, why stop at paws? What if she could get her very own Bear magnet to display proudly on her car? There isn't enough room in the back of the car, so why not on the front passenger's side? This is the ultimate in stating my dog is my co-pilot. Well the ultimate for us since we don't have a plane. Can someone please make a magnet for us?